The financial services industry is looking to create around 3,000 new jobs and a further 1,000 in financial technology a year under a road map to transform the sector. At the same time, banks and financial institutions have to do more to retrain workers whose jobs are affected by disruptive changes in the industry and match them to new jobs, Minister for Education (Higher Education and Skills) Ong Ye Kung said yesterday. He added that the financial services Industry Transformation Map (ITM), which was unveiled yesterday, aims to lift the financial services sector's real value-add by 4.3 per cent and its productivity by 2.4 per cent annually. The most important aspect of any transformation plan lies in the people, said Mr Ong, who is also on the Monetary Authority of Singapore (MAS) board. However, he noted that when an existing activity is disrupted and jobs become at risk, the tendency is to lay off staff. "But this cannot be the solution of first resort. For professionals who have honed their craft over many years, a large part of what they already know can be reapplied within the financial services sector or in other adjacent sectors," he said. Without addressing the concerns of those affected by change, there can be no change and, by extension, no innovation, Mr Ong added. The MAS will help tackle this issue by working with key financial institutions to make a strong push in implementing Professional Conversion Programmes (PCPs) to help staff move into new jobs, including in growth areas such as technology and compliance. It is also working with partner agencies to expand career advisory and job-matching services for the financial services sector and to provide guidance on the training and help that sector professionals will need to enrol in PCPs or seek new opportunities. More broadly, Mr Ong said the financial services industry has to expand and deepen its talent pool at a pace that can catch up with that of digitisation and automation, which are redefining job roles. To develop deep capabilities, noted Mr Ong, Singapore also has to anchor the best international capabilities here and grow its own timber over time. National Trades Union Congress assistant secretary-general Patrick Tay told The Straits Times that the ITM is timely, given the rapid changes affecting the finance industry and which have already started making various traditional banking roles obsolete. "It's a collective effort. The MAS is working closely with the labour movement and partner agencies. But another key is a mindset change among employers and workers," he said. "Employers have to be open to strengthening the Singaporean core, while workers have to stay able, agile and adaptable as things are happening very quickly and you never know what jobs will become obsolete." Aside from jobs and skills, the ITM outlines other growth strategies for the financial services industry. 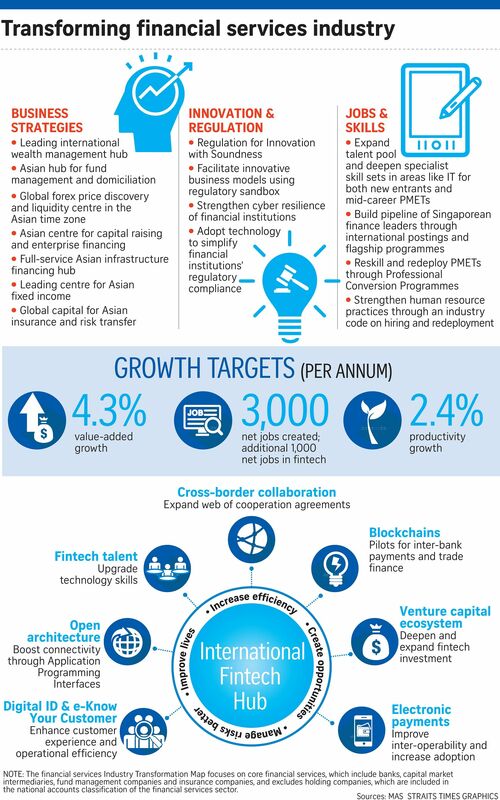 These include developing Singapore as a centre of excellence for wealth management, anchoring deeper asset management capabilities here and creating a full-service Asian infrastructure financing hub. A key focus of the ITM will be on facilitating pervasive innovation in the financial sector and encouraging the adoption of technology such as distributed ledgers. United Overseas Bank chief executive officer Wee Ee Cheong welcomed the ITM, saying it charts the way forward to enable Singapore's continued relevance, place and leadership in an ever-changing environment. "Ultimately, the customer is at the core of the industry's transformation. They expect simpler, smarter and safer financial solutions which are enabled by technology and that are relevant to their lifestyles and business needs," he said. "The continued investment in our infrastructure, capabilities and people is therefore essential."